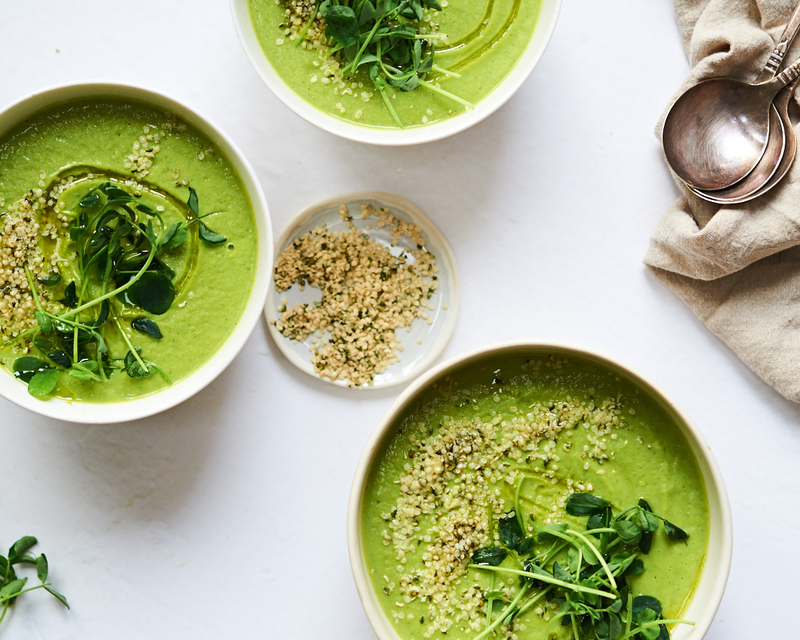 Perfect for a cold winter night, warming and comforting, we love this broccoli based soup. We’ve added in hempseeds in place of using cream or dairy to create a sense of creaminess. Plus, hempseeds are a source of omega 3 fat that supports brain health. Chop all the veggies. Use the broccoli stalks too. We just like to peel off the tough outside layer and then roughly chop the stalk into pieces. Heat a large pot with some extra virgin olive oil. Add in the onion and garlic for a few minutes. Add in the broccoli florets and stalks along with the rutabaga. Pour the water over top and bring to a boil. Reduce heat and simmer, covered, for 25-30 minutes. Right at the end add in the chopped kale and stir around to wilt. Carefully pour this into the blender, adding the hempseeds. Blend into a creamy smooth mixture. Add sea salt and pepper to taste. Top with extra virgin olive oil, some more hempseeds and green sprouts if you like!